A few days ago, I read about how Joy of KnitsyBitsy had successfully used kate flour to make Peanut-Butter Chocolate-Kiss Cookies. Well, I never knew that cookies in the US were any different from cookies in the UK! What had I been missing out on all these years? 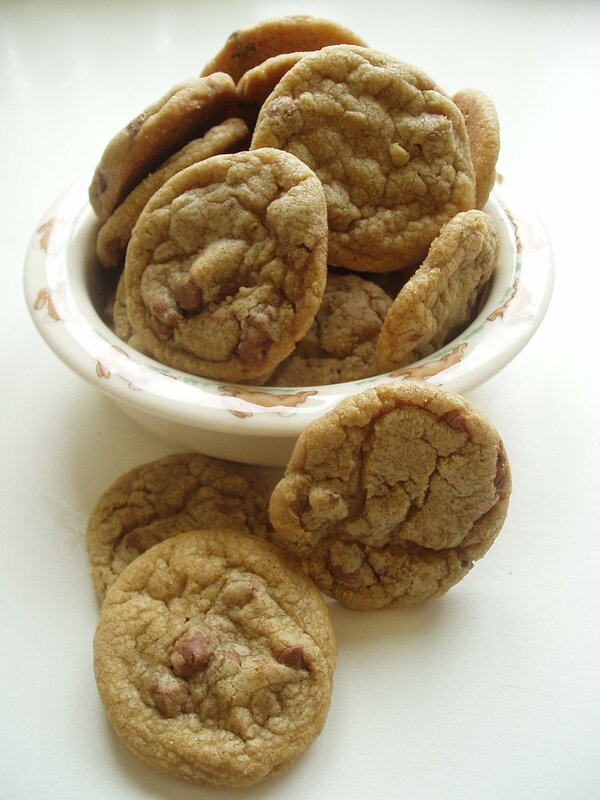 Thick, crunchy and chewy chocolate chip cookies. Mmmm. And bleached flour was responsible for this? Needless to say, I had to try it out with kate flour to see if it too would give these results. I don’t (yet 😉 ) own Rose Levy Beranbaum‘s book of cookie recipes, so I decided just to go with the recipe from Cook’s Illustrated that I found here (although as a side note, I have to say that I found these cookies too sugary for my taste). I blasted 10 0z of plain flour in the microwave for a total of 6 minutes (stirring after each minute) until it reached 130 degrees C. I sieved the flour to remove any lumps and left it to cool to room temperature. I then used this flour in place of the bleached all-purpose flour called for in the recipe. True to their word, these cookies were indeed crunchy on the outside and chewy inside. My daughters loved them! Guess what they had for breakfast this morning? Thank you for setting me on to this with your Peanut-Butter Chocolate-Kiss cookies, Joy 🙂 .